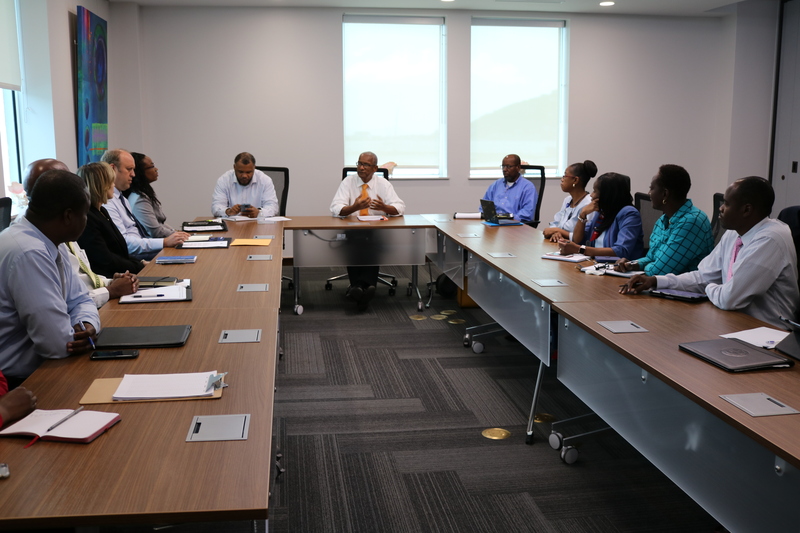 Premier and Minister of Finance, Dr. the Honourable D. Orlando Smith, OBE, on Tuesday, December 5 held two separate meetings with the Territory’s insurance providers and banks to discuss matters relating to the processing of claims and the status of loan moratoriums following the passage of Hurricanes Irma and Maria. The meetings were the second round Premier Smith has had with managers from the two sectors. The Premier has said that both insurance companies and banks have an essential role in helping residents and businesses across the Virgin Islands in their rebuilding efforts. With insurance providers, Premier Smith discussed concerns raised by the public on the timely resolution of claims, disparities in estimated costs of damages and settlements, the pricing of salvaged vehicles and new increased premiums faced by residents. In the meeting, Premier Smith shared with companies the urgent need to get claims processed so residents can rebuild their homes and have safe housing for those that are still displaced, but also so that commercial properties can be restored to bring back services that have been disrupted. Similarly, with the banks, he shared strong concerns about the process of releasing funds from insurance claims to residents so that they can begin repairs to both homes and commercial buildings. Premier Smith said the conversations were very informative and did shed light on complaints being brought up by residents. However, he remains concerned that insurance claims are not being addressed promptly, and not enough information is provided to the public. Also present at the meetings were managers from the Financial Services Commission (FSC), the agency with a mandate to regulate the Territory’s financial services. The agency’s representative, Ms. Simone Martin said that there is a need for more consumer education by providers. On the request of the Premier and through the Insurance Association of the BVI and the BVI Bank Association, both sectors have agreed to immediately find opportunities to engage the public, answer questions and better educate clients on their services and options for rebuilding. The Premier plans to hold follow-up meetings to ensure this plan of action is carried out across both sectors. To further assist residents, Premier Smith indicated that Government would be looking to extend the duty-free exemption on some items, particularly building supplies as sufficient insurance claims have not been resolved. The duty-free exemption presently expires on December 31.